Every year during Family Weekend, the Baylor Parents Network selects one family to represent the hundreds of family members who go above and beyond in giving of their time to welcome and support Baylor students and each other. This year’s Parents of the Year are Fran and Craig George of Raleigh, North Carolina. “Oh, that’s nice,” thought Craig, who believed his daughter was expressing her own loving thoughts about her mom and dad. It was only when he spoke to his wife, Fran, that he learned the news—the Georges had been named Baylor University Parents of the Year for their efforts to share and grow the Baylor Family in North Carolina. When their oldest daughter, Mary Scott, chose Baylor, she asked Fran if she would be as involved at Baylor as she was with Benjamin’s school. Another family member told Fran, “Baylor is a major university. They don’t need you.” However, when the Georges found out about the Parents Network, they discovered they were needed indeed. Before Mary Scott or Catherine ever took a class on campus, their parents were hosting events with other Baylor families in North Carolina. A Send-Off Party opened the door to Packaging Parties, and then alumni gatherings. Soon, a North Carolina chapter of the Parents Network was formed, sharing the Baylor experience with hundreds of families in their state. Mary Scott graduated in 2016 with a degree in corporate communications, then returned to pursue a passion for nursing, receiving a nursing degree in 2018; Catherine is a junior communications major on track to graduate in 2020. 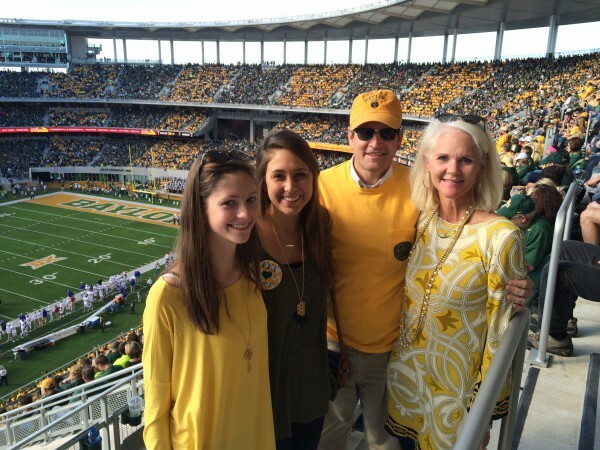 Long after their daughters are drawing on their Baylor experiences in the professional world, the Georges plan to stay involved with the university they’ve grown to love. For their tireless support as volunteers and their passion to share their love of Baylor with so many families in their home state, Fran and Craig George are the 2018 Baylor Parents of the Year. Click to read Fran’s posts on the Parents Guide to Admissions blog.